Ifosfamide may cause serious side effects (e.g., urinary problems such as hemorrhagic cystitis, mental/mood changes, and blood/bone marrow disorders), which may require your treatment with this medication to be stopped. Tell your doctor right away if you develop symptoms such as pink/bloody urine, frequent/painful urination, severe drowsiness, confusion, or hallucinations. Blood/bone marrow disorders can affect your body's ability to stop bleeding or fight infection. Tell your doctor right away if you develop easy bruising/bleeding or signs of infection (e.g., fever, chills, persistent sore throat). Who should not take Ifex Vial? To help prevent urinary problems, drink plenty of fluids and urinate frequently while using this medication unless otherwise directed by your doctor. Your doctor may also prescribe other medication (e.g., mesna, IV fluids) to decrease the risk. What conditions does Ifex Vial treat? Nausea, vomiting, diarrhea, stomach/abdominal pain, loss of appetite, or redness/pain/swelling at the injection site may occur. Nausea and vomiting can be severe. In some cases, your doctor may prescribe medication to prevent or relieve nausea and vomiting. Eating several small meals, not eating before treatment, or limiting activity may help lessen some of these effects. If these effects persist or worsen, tell your doctor or pharmacist promptly. Temporary hair loss frequently occurs in patients using this drug. Normal hair growth should return after treatment has ended. Tell your doctor right away if you have any serious side effects, including: unusual weakness, seizure. List Ifex Vial side effects by likelihood and severity. Before using this medication, tell your doctor or pharmacist your medical history, especially of: blood/bleeding disorders (e.g., anemia, low blood cell counts), current infection, kidney disease, liver disease, radiation treatment. This drug may make you drowsy. Do not drive, use machinery, or do any activity that requires alertness until you are sure you can perform such activities safely. Limit alcoholic beverages. This medication may affect the production of sperm, increasing the risk of fathering a child with birth defects. Therefore, men receiving treatment with this drug should use reliable forms of birth control (e.g., condoms). Consult your doctor for details and to discuss effective forms of birth control. What should I know regarding pregnancy, nursing and administering Ifex Vial to children or the elderly? Some products that may interact with this drug include: other anti-cancer drugs, nalidixic acid. 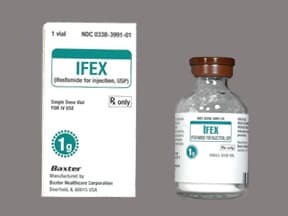 Does Ifex Vial interact with other medications? Laboratory and/or medical tests (e.g., complete blood counts, blood salt/mineral levels, kidney function tests) should be performed periodically to monitor your progress or check for side effects. Consult your doctor for more details. 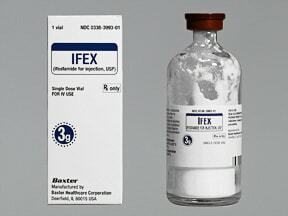 Are you taking Ifex Vial? Are you considering switching to Ifex Vial? How long have you been taking Ifex Vial?